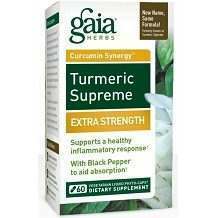 This is a review for Gaia Herb’s Turmeric Supreme Extra Strength, which is formulated to help fight inflammation while providing a range of other benefits ranging from improved circulation and cardiac health to reduced risk of some cancers. Made with three different types of turmeric, and combined with black pepper, it relies on natural, straightforward ingredients to enhance wellness without the unpleasant side effects of over-the-counter medications. Turmeric root extract has been used for thousands of years in natural medicine. Turmeric and the compound curcumin contained within has been scientifically proven as a powerful anti-inflammatory agent. It is also an extremely potent antioxidant, which helps reduce the risk of many types of cancer, and reduces cellular ageing. Other benefits include improved cardiac and digestive health, stronger immune system response, and improved joint mobility and liver function. 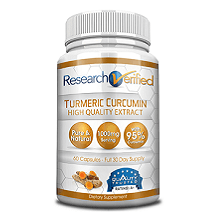 Turmeric root supercritical extract has undergone a method of extracting the beneficial compounds of turmeric to create a more potent substance. This, combined with the standard turmeric root, creates an especially powerful supplement that requires fewer tablets for equal effectiveness. Black pepper extract has been shown to improve digestion while reducing gas and bloating, which helps the body absorb both the turmeric in this supplement and other nutrients in the form of other supplements or food. Other benefits include support to cognitive and respiratory health. Both turmeric and black pepper share many similar benefits, including improved digestion, circulation, and support for cognitive health. Because of this, they act to complement each other, creating a supplement which is specially designed to not only decrease inflammation throughout the body, but which enhances the health of every system in the body. For best results, one capsule should be taken one to two times per day with a meal. Women who are pregnant or breastfeeding should not take this supplement, and it should not be given to children. Turmeric has anti-coagulant properties, so if you are taking blood thinners or have a blood disease you should consult a doctor before taking this supplement. You can purchase Turmeric Supreme Extra Strength online from the Gaia Herbs website for $29.99 for a 60-tablet bottle, and $49.99 for a 120-tablet bottle. There are various savings available for buying multiple bottles of each. If you sign up for a subscription you will receive 10% off of your purchase and an unspecified free gift. Gaia Herbs offers a 100% satisfaction guarantee, which speaks to the high quality and efficacy of the product. By sending back the unused portion you can get a full refund. The timeframe to return the product is not specified. This product seems to contain the necessary ingredients to know you are getting a good-quality product. It also seems to be great value at this price point. The capsules are vegetarian, and gluten free which makes them suitable for most people. The dosage instructions are a little unclear as to when you should take one capsule a day and when you should take two. We were also unable to find customer reviews available through the company’s site, so it is unclear what individual experiences are like.